Just so you can see how bubbly the crust is. Interestingly, I'm only posting this recipe separately from my ciabatta bread post because when I was trying to edit the ciabatta bread post, I inadvertently deleted the part about making it into pizza. 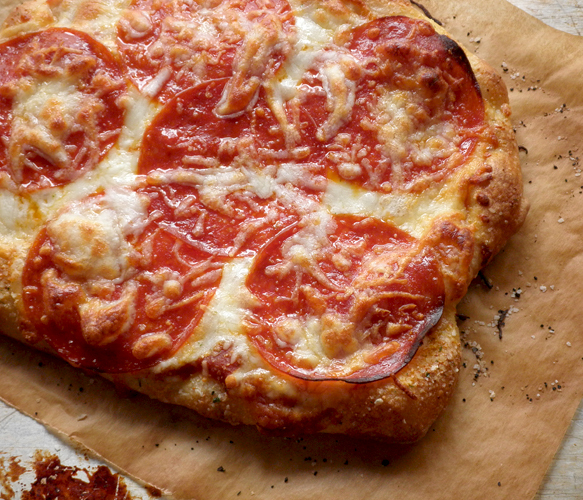 So now, ciabatta crust pizza gets its own post. It's probably better that way. We have pizza in several forms at our house: ciabatta crust pizza, thin crust pizza, Chicago style pizza, pita bread pizza, Pizza Hut, Northern Lights Pizza (they make the BEST bread sticks), and even Totino's frozen pizza (yes, I LOVE it). This pizza, though, has my older son's vote as favorite pizza because the crust is also delicious garlic bread. This crust is light, crisp, and chewy; sturdy enough to hold lots of good toppings, but not heavy at all. It's also great if you make it ahead and freeze, so you have pizza crusts on hand for a quick meal. Granted, it's not quick making the crusts--you need to plan at least 24 hours in advance to make it--but if you have time (and a stand mixer and a baking stone), it's well worth the effort. 2. FOR THE DOUGH: Place biga and dough ingredients in bowl of stand mixer fitted with paddle attachment. Mix on lowest speed until roughly combined and shaggy dough forms, about 1 minute; scrape down sides of bowl as necessary. Continue mixing on medium-low speed until dough becomes uniform mass that collects on paddle and pulls away from sides of bowl, 4 to 6 minutes. Change to dough hook and knead bread on medium speed until smooth and shiny (dough will be very sticky), about 10 minutes. Transfer dough to large bowl and cover tightly with plastic wrap. Let dough rise at room temperature until doubled in volume, about 1 hour. Slide parchment with loaves onto inverted, rimmed baking sheet or pizza peel. 3. Spray rubber spatula or bowl scraper with nonstick cooking spray; fold partially risen dough over itself by gently lifting and folding edge of dough toward middle. Turn bowl 90 degrees; fold again. Turn bowl and fold dough six more times (total of eight turns). Cover with plastic wrap and let rise for 30 minutes. Repeat folding, replace plastic wrap, and let rise until doubled in volume, about 30 minutes longer. Meanwhile, adjust oven rack to lower-middle position, place baking stone on rack, and heat oven to 450 degrees Fahrenheit at least 30 minutes before baking. 4. Prepare a pizza peel, inverted cookie sheets, or a rimless baking sheet with parchment paper. You will need two of these. Transfer dough to liberally floured counter, being careful not to deflate completely. Liberally flour top of dough and divide in half (or fourths if you want to make small pizzas). Turn 1 piece of dough so cut side is facing up and dust with flour. With well-floured hands, press dough into a rough 12-inch circle (about an 8 inch circle for small pizzas). Carefully transfer to parchment-lined baking sheet or pizza peel. 5. Using floured fingertips, evenly poke entire surface of each loaf to make dimples all over the dough (this prevents crust from ballooning into pita bread). Carefully slide parchment with crusts onto baking stone using jerking motion. Bake at 450 degrees for 10-12 minutes, or until bubbles on top and bottom are lightly browned. Transfer to wire rack to cool and wait for pizza making. Two small crusts. Not very round, but good. 6. With a pastry brush, spread some butter around the edge of the crust. 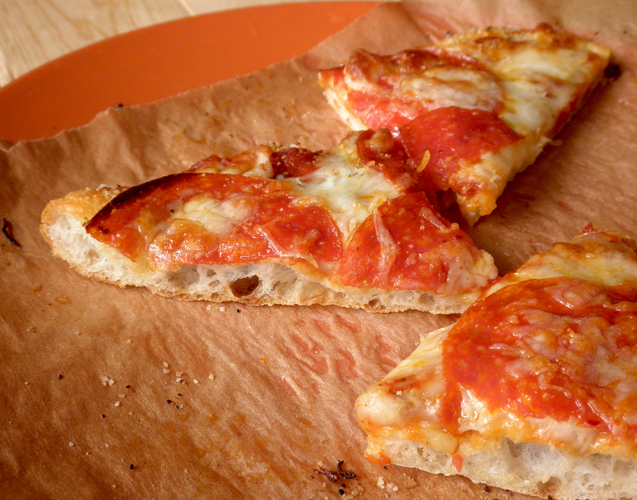 Spread 1/2 cup of sauce onto pizza. Mix the cheeses in a large bowl and use half (or less) to top the sauce. Then sprinkle garlic salt all over top of cheese and around the crust edge. Top with other favorite toppings. Bake at 450 degrees until cheese is melted and bubbly. Carefully remove with pan or peel. Allow to sit for a couple of minutes and then slice with a pizza cutter. Serve hot, but be careful. Makes two large, or four small pizzas. So excited to make this! Our favorite pizza restaurant in Boston uses a ciabatta crust and it's to die for! Hopefully this will help us recreate it at home! Thanks! Well, if you think of it, let me know how you liked it! 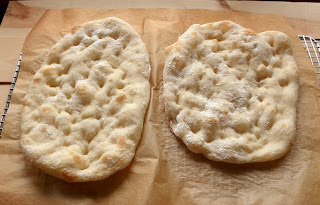 Has anybody else played the Cook's Illustrated ciabatta bread video while reading this blog? It's like following along with a bouncy ball while Raffi sings a song that your kids thought you made up. I made this crust tonight and it was wonderful! I made a few changes to rise steps due to time constraints, but it worked! I let the starter rise for 5 hrs, added the other ingredients, then did ONE rise of 1 hr. Then shaped the dough GENTLY with no kneading on a parchment sheet into a large circle. Added homemade pizza sauce, cheese, toppings and EVOO brushed on crust. Spinkled crust with a little garlic salt. Baked at 450 on a pizza stone for about 15 mins. AWESOME crispy chewy crust. I made this tonight and the whole family loved it! I had to reduce rise time, but it worked! Let biga rise for 5 hrs, then added dough ingredients and let it rise 1 hr. After the rise, I handled dough gently and shaped into a large circle on parchment-lined pizza peel. Added toppings, EVOO to crust, and transferred to hot stone in 450 oven for about 15 mins. Perfect pizzeria-quality pizza! Thank you!